Are you looking for fast and professional commercial locksmith help in Allentown PA for your business? If you don’t know where to start, you can come to LockTech24/7 for security consultation. Talk to our specially trained staff. Their expertise on the latest locksmith technology will help you find the perfect security solution for your business. We are the nonstop corporate locksmith team to call in Allentown, PA! 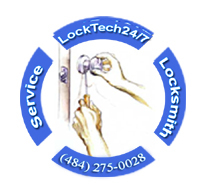 LockTech24/7 is your local locksmith aid! It takes a lot of time and effort for you to build, expand and establish your business. You have collected assets and valuables machines that you’ve placed in your business. You got loyal employees who come with their wallet, purse and valuable things. It is obvious that you will be concerned about their protection and safety. With the aid of our affordable commercial locksmith solutions, you successfully are able to protect your business. 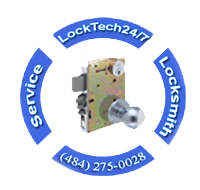 LockTech24/7 is #1 company to call in Allentown PA for any industrial and commercial locksmith needs. Our unique qualifications mean that we know how to safely, securely and effectively manage every lock in your building. We serve the commercial and industrial community of Allentown with exceptional security hardware. Our locksmiths can handle your lock-related problem. We have a wide selection of advances security measures to make sure that your office building is as safe as possible. Clients that benefit from our commercial security services include, but are not limited to; hospitals, government offices and banks. As well as schools, libraries, public storage spaces, and more. Our company takes a great pride in our locksmith services and its result. Our services provide you with the swift service you deserve, topped by competitive prices. No matter where you are in Allentown, Bethlehem, or Easton, you’re right now. We’re fast, accurate, efficient, and we know how to save your time and money. Whether it’s a storefront or offices building, it is important to know all of your work and company files are secure. With all of our options, we will help you mix and match security measures until we find the right combination for you. Commercial locksmith can help when you want peace of mind. In addition, commercial locks are a very effective way to protect your business from forced entry. We offer a professional installation on all types of commercial locks. When security is your top priority, you can rely on us to provide you with the most comprehensive and responsive service. Call us now for consultation. 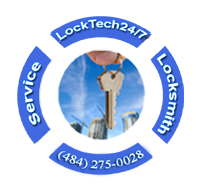 The locksmiths at LockTech24/7 can perform any locksmith service for for your office. Our locksmiths specialize in the replacement and repair of all commercial locks. We can also remove a broken key out of your lock, re-keying locks, push bar repair, and more. Emergency commercial locksmith services are perfect for lock out and broken key removal. As well as if you are a property business owner that was a victim of a burglary. Are you locked out of your business and your customers are knocking on your business’s doors? 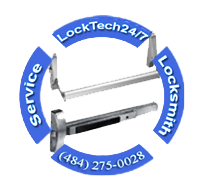 If you find yourself locked out of your office or your storefront, LockTech24/7 is the locksmith to call! Just to point out, we can also unlock a file cabinet inside an office. Every day, there are many people that manage to lock themselves out of their business. This can happen when you least expect. For instance, you can lock yourself out when you go to throw the trash outside. On other occasions, you can leave the keys with your manager. But he is out of town right now. Regardless of the reason that you lock yourself out of your office. 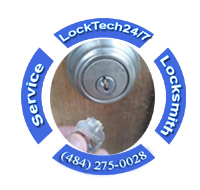 You need LockTech24/7 lockout service in Allentown that you can count on. LockTech24/7 is accredited business by the BBB, and licensed by the State of PA. We are the locksmiths to trust in order to unlock your door safely. 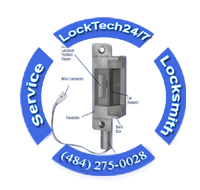 LockTech24/7 is a local running business that puts Allentown customer satisfaction first. Our locksmiths are professionals in every parameter, who can give you variety of solutions to your lock issues. Not only are we capable of being there to help during a lockout emergency, but we also capable to accomplish every job on the spot. You have fired one of your staff he didn’t return the keys to your business. This is a serious security issues which you must address as soon as possible. In general speaking, whenever you need to re-key locks in a commercial property, you can call us. 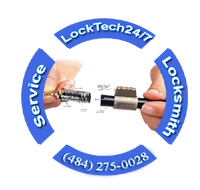 The best thing in such a case is call LockTech24/7 at Allentown PA to re-key your locks. The old key will no longer operate the locks, and you’ll get a new fresh key for your business. While we’re re-keying your locks, we change the combination of the pins inside the cylinder to match a new key. We can also re-key your locks to create a master key system. You’ve noticed the locks on your business doors are very old, rusty, and burly working. It is very hard for you to lock or unlock the door. When you have problem with the lock or door’s mechanism, this is the time to call us to change the locks on your doors. Having the locks change done by our locksmith is a better choice than doing it yourself. Or even calling an unprofessional locksmith. Commercial locks can be hard to manage, especially in the winter when it’s very cold outside. Your lock can freeze out and jam. Because commercial doors are very heavy, some of them attached to push-bar. And other locks have not enough strength to keep up with heavy commercial doors and brake. 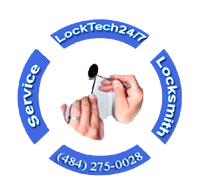 LockTech24/7 is the professional commercial locksmith company in your first choice of call in Allentown. We believe that we need to be fast, upfront and fair with prices, and most of all, honest with our clients. Which means that you’ve made the right decision by hiring us. Protect your business assets, protect your investment! Call us now! Keys are often to break inside the lock because a tiny crack or a broken lock. Unfortunately, there are some cases when you’re trying to open your business door, and suddenly the key breaks. It is a very unpleasant situation to start your day with a broken key. In this case it is not recommended to try to extract the key, by yourself. If you use different tools such as pliers or screwdriver, you can push the key deeper and damage the lock. You have a better option, to call us because we use special tools to extract your key out of your lock. If you have reached this page, chances are that you broke your business key and you need help. If so, you have found the best solution for your security business problem because LockTech24/7 Locksmiths can help. Mortise lock and Adam-Rite door mechanism are the best example for popular system in almost every business. Adams Rite earned its reputation as a leader in commercial locking systems and security hardware. Adam Rite offers innovative lines of door mechanisms, electric strikes, exit devices, and more. The installation, repair or replacement of Adam Rite mechanism cannot generally be undertaken by the average business owner, or the maintenance person. Since it is labor-intensive and requires a working knowledge of a skilled locksmith, including special tools and methods. Our professional locksmiths are ready to solve any commercial lock and door mechanism problem in your business. Every commercial property owner required to install push-bar on the door of his business. In case of emergency situation, your clients and your employees should have an easy and fast way out. When fire occur, they need to evacuate the building safe, and quickly as possible. Push bar is an exit device on an exit door that allows people in the building to exit quickly in emergency moment as fire. Because fire codes exist, and many people can be inside your commercial space, you’re required to have an easy means of exit during an emergency. Otherwise you get a problem to renew your business license. We can serve both, industrial and commercial businesses in Allentown, Pennsylvania, and the greater Lehigh Valley surrounding area. It is important to have a professional and trusted locksmith company to handle the installation of a push-bar, to meet those guidelines. You want to keep your office lock and secure all day long while your staff is working inside. Fortunately, you have a busy office and your customers are knocking on the door all day. Your secretary is sitting far from the main door and she need to get up of her chair every time someone ring the bell. Would you like to be able to open the main door by pressing on the button near your desk? Your secretary sits far from the main door, need to get up of her chair every time they ring the bell. Electric strike is an access control used for commercial doors, usually in office building. It replaces the fixed strike face-plate often used with a latch-bar (also known as a keeper). This system gives you the ability to stay sitting on your chair, while you still can open the main door of your office. All you need to do is to press on the button, which is located in your favorite spot. When you’re looking for a reliable locksmith company to maintain fresh installation for electric strike system, you may give us a call for estimate. You will be surprise to find out how easy this project can go for you, please call us for a quote / estimate now. We can also repair or replace a broken electric strike system in a fairly time frame.